One common myth is that the buzzing sound of bees is caused by the beating of their wings. The sound is actually the result of the bee vibrating its flight muscles. This this can be done while the muscles are decoupled from the wings, a feature known in bees but not possessed by other insects. This sound is especially pronounced in bumblebees because they must warm up their bodies considerably to get airborne at low temperatures. 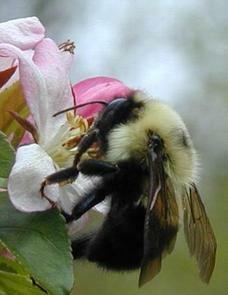 Bumblebees are social insects that are characterized by black and yellow body hairs, often in bands. Some are known to have orange or even red on their bodies, or may be entirely black. They have long, branched setae (pile) covers their entire body and makes them look and feel fuzzy. They are best distinguished by the form of the female hind leg, which is modified to form a corbicula; a shiny concave surface that is bare but surrounded by a fringe of hairs, used to transport pollen. Queen and worker bumblebees can sting, but the sting is not barbed so they can sting more than once. The bumblebee species is non-aggressive, but will sting in defense of their nest, or if harmed. Bumblebees form colonies (30-150 workers at best) that are usually much less extensive than those of honey bees because of the small physical size of the nest cavity. This small size is because initial construction of the nest is completed by a single female, restricted to a single season and are abandoned after use. It is rare that these bees would preserve their nests through the winter, though some tropical species live in their nests for several years. Often, mature bumblebee nests will hold fewer than 50 individuals and may be in underground tunnels made by other animals, or in tussock grass. Nest in the ground are usually in cavities of a wall or in a dryer vent. Other nests can most commonly be located in flowers beds, wood piles, or walls of high traffic areas. Bumblebees extract nectar from a flower using their long tongue and store it in their crop. Some also exhibit what is known as "nectar robbing". Instead of inserting their mouthparts into the flower, they bite directly through the base of the flower to extract nectar and in doing so avoid pollen transfer. Still these bees will complete pollen transfer with other flowers without completing this "nectar robbing." Once bumblebees have collected nectar and pollen, they return to the nest and deposit the harvested nectar and pollen into brood cells, or into wax cells for storage. Unlike honey bees, bumblebees only store a few days' worth of food and because of this they are much more vulnerable to food shortages. Nectar is stored essentially in the form it was collected, rather than being processed into honey as is done in honey bees; it is therefore very dilute and watery, and is rarely consumed by humans. Trapping bumble bees is not practical and exclusion techniques may not be a long term solution, therefore when controlling bumblebees it is necessary to employ the help of professional pest control company.